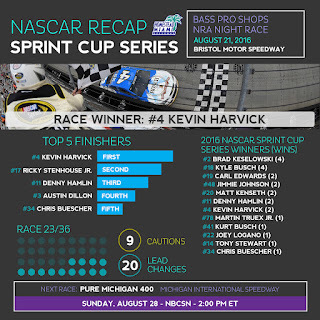 · Kevin Harvick won the 56th Annual Bass Pro Shops NRA Night Race Sunday. For Harvick, it was his 33rd victory in 561 NASCAR Sprint Cup Series races. 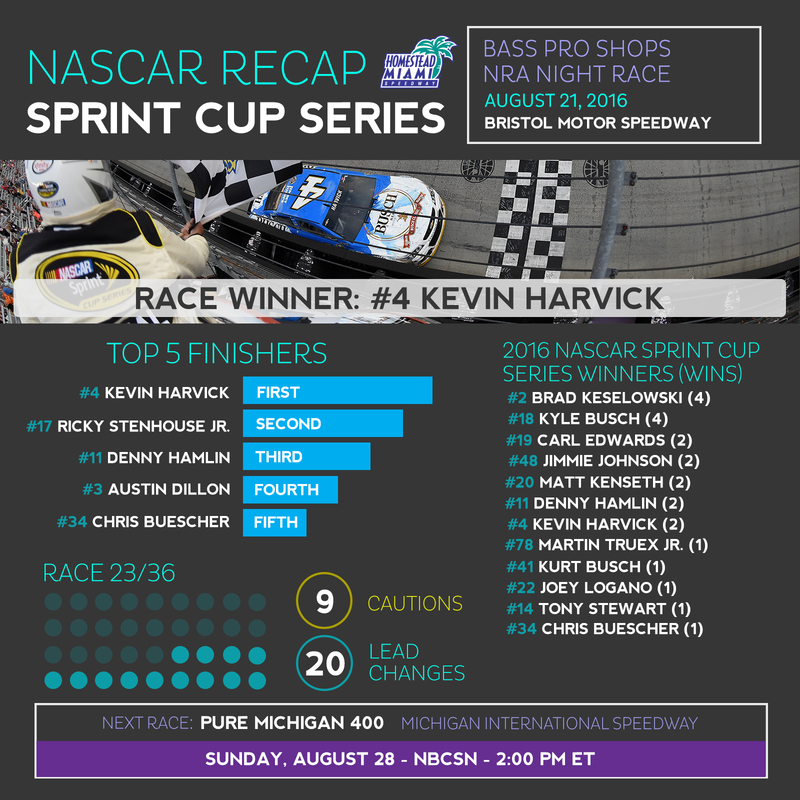 · It is Harvick’s second victory and 18th top-10 finish in 2016. Harvick ended a streak of 18 races without a win, with his last victory coming at Phoenix International Raceway on March 13, 2016. · It is Harvick’s second victory and 15th top-10 finish in 32 races at Bristol Motor Speedway. His last win at Bristol came April 3, 2005. · Ricky Stenhouse Jr. (second) posted his fourth top-10 finish in eight races at Bristol Motor Speedway. · Stenhouse’s second place finish matched his best showing of his career, which also came at Bristol Motor Speedway in March 2014. · It is Stenhouse’s fifth top-10 and third top-5 showing of the 2016 season. · Denny Hamlin (third) posted his 10th top-10 finish in 22 races at Bristol Motor Speedway. · Austin Dillon finished fourth, giving him his 10th top-10 and fourth top-5 showing through 23 races this season. · Chris Buescher (fifth) posted his second top-10 finish this year. He was also the highest finishing rookie at Bristol Motor Speedway. · Eleven drivers have qualified for the 2016 Chase for the NASCAR Sprint Cup, a list which includes Tony Stewart, Joey Logano, Kurt Busch, Carl Edwards, Kyle Busch, Denny Hamlin, Jimmie Johnson, Brad Keselowski, Kevin Harvick, Matt Kenseth and Martin Truex Jr., all of who have taken checkered flags this year. · As a result of his victory in the Pennsylvania 400 in Pocono on August 1, Chris Buescher would also qualify so long as he finishes in the top-30 in points after the season’s 26 regular season races. Buescher currently sits in the 30th spot with 328 points, 13 points ahead of David Ragan (315), who is in 31st. The Chase culminates with the Ford EcoBoost 400 championship race on November 20 at Homestead-Miami Speedway. · In 15 Sprint Cup Series starts at Homestead-Miami Speedway, Kevin Harvick has recorded 12 top-10 and seven top-5 finishes. Also, Harvick celebrated his 2014 Sprint Cup Series championship at Homestead-Miami Speedway after winning the Ford EcoBoost 400. · Austin Dillon won the 35th Annual Food City 300 XFINITY Series race at Bristol Motor Speedway Friday night. It was his eighth victory in 111 NASCAR XFINITY Series races. · It is Dillon’s second victory and 12th top-10 finish in 2016. · It is Dillon’s first victory and fourth top-10 finish in seven races at Bristol Motor Speedway. · Justin Allgaier (second) posted his seventh top-10 finish in 12 races at Bristol Motor Speedway. It is his 18th top-10 finish in 2016. · Kyle Larson (third) posted his sixth top-10 finish in seven races at Bristol Motor Speedway. · Brandon Jones (ninth) was the highest finishing rookie. · Through 22 races this season in the XFINITY Series, Erik Jones, Daniel Suarez and Elliott Sadler have qualified for the 2016 XFINITY Series Chase following their victories. Kyle Busch, Kyle Larson, Austin Dillon, Chase Elliott, Dale Earnhardt Jr., Denny Hamlin and Joey Logano have also won an XFINITY Series race this season but are ineligible for the XFINITY Series Chase due to their full-time status in the Sprint Cup Series. Sam Hornish Jr. and Justin Marks are also ineligible because they are not full-time drivers in the XFINITY Series.